Rev. Thomas G. Langenfeld, CSV, died Saturday, October 1 at 3:00 a.m. in Las Vegas, NV as the result of an accidental fall. He was 79 years old. Fr. Langenfeld was born on August 13, 1932 in Springfield, IL and was one of eleven children born to Clifford and Elizabeth (Newman) Langenfeld. He is preceded in death by his parents and his brothers Harry and John. He is survived by 8 brothers and sisters: Richard, of Dixon, IL; Gary of St. Louis, MO; Mark of Normal, IL; Michael of Springfield, IL; Clifford of Garden Grove, CA; Catherine Van Den Bossche of Springfield, IL; Rose Marie Weymouth of Island Lake, IL; and Theresa Ulrich of Highland OH. Fr. Langenfeld professed his first vows on August 15, 1951. After his seminary studies at the Viatorian Seminary in Evanston, IL he was ordained priest on May 28, 1960 by Bishop Martin D. McNamara in Joliet, IL. Fr. Langenfeld was a graduate of Cathedral Boys High School in Springfield, IL. At Loyola University in Chicago, IL he earned a BA degree in Political Science. He then earned an M.Ed in Guidance from St. Louis University, St. Louis, MO and a Licentiate degree in Sacred Theology from the Catholic University of America in Washington, D.C. He also studied Theology at the University of Louvain in Belgium and Weston School of Theology in Cambridge, MA. Fr. Langenfeld taught at Spalding Institute in Peoria, IL from 1955-1956 and again from 1965-1968. From 1962-1965 he taught as a professor at the Viatorian Seminary. 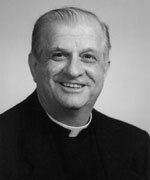 From 1968-1970 he served as Assistant Principal of Saint Viator High School in Arlington Heights, IL and then as Principal at Bishop McNamara High School in Kankakee, IL from 1970-1972. During the General Chapter of the Clerics of St. Viator held in the summer of 1972, Fr. Langenfeld was elected as Superior General of the Congregation, and re-elected in 1978 for an additional 6 year term of service. Throughout these years of leadership, Fr. Langenfeld led the International Congregation amid the dramatic era of Vatican II. 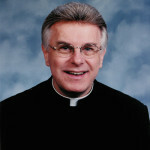 After his term as Superior General, he was granted a sabbatical year at Weston Theology School in Cambridge, MA. He then returned to Chicago as Director of the Viatorian Formation program and in 1986, he was assigned as Pastor of Immaculate Conception Church in Kankakee, IL where he served until 1988. From 1989-1994, he served as Pastor of St. Patrick Church in Kankakee. From 1994-1999 he served as Pastor of St. Viator Church in Las Vegas, NV. From 1999-2000, he served the Diocese of Las Vegas, NV as Director of Clergy Formation and part-time ministry at Guardian Angel Cathedral. In 2002, Fr. Langenfeld retired from ministry and resided in Las Vegas, NV. Two funeral services were scheduled to celebrate the life of Fr. Langenfeld. On Wednesday, October 5, 2011, there was a visitation followed by a memorial Mass at St. Viator Church in Las Vegas, NV. The visitation was from 10:00 a.m. to 11:00 a.m. with Mass of Resurrection that followed at 11:00 a.m.
Fr. Langenfeld’s remains were transferred to Kankakee, IL where there was a visitation and wake service at St. Patrick Church on Friday, October 7, 2011. Visitation began at 4:30 p.m. and concluded with a wake service at 7:00 p.m. On Saturday, October 8, 2011, a Mass of Christian Burial was celebrated at 10:00 a.m. at St. Patrick Church. Interment was at Queen of Heaven Cemetery in Hillside, IL. Please remember Fr. Langenfeld in your Masses and prayers.